December 17, 2016 by David Shields. Average Reading Time: about 26 minutes. In his 1964 American Wood Types folio, Rob Roy Kelly published 15 manufacturer’s stamps, with dates of use, and included an explanation of the stamping process. Five years later he would use this explanation to accompany 16 manufacturer’s stamps in his book American Wood Type 1828–1900. Robert Long published Wood Type & Printing Collectibles in 1980 that showed 11 American manufacturer’s stamps, two of which had not been previously shown by Kelly. To date, 25 stamps and two die-cut impressions, used by American wood type manufacturers, have been recorded, and are included in this catalog. This catalog also acts as a rough draft for developing a proposal to bring the tools of bibliographic analysis to bear on the currently available evidence of wood type manufacturer’s stamp. Admittedly a willful stretching of the term bibliographic, the goal of this project is to develop an analytical description of the type block as object, and to develop an accurate method to compare for mark variation. The analytical description proposed here includes stamp name/text (in quasi-facsimile transcription), stamp configuration, and dates of use. The next iteration of this description would also include stamp measure, as well as location and orientation on block. The purpose of developing this catalog of the physical description of the type blocks is — to paraphrase the American bibliographer Fredson Bowers1 — twofold: to serve as a basis for the analysis of the methods of production and distribution; to provide evidence to the user of the type — collector, printer, typographer — to effectively identify types in their possession. Compiling this list also serves the intention of proposing a standardized system for transcribing the block information as precisely (and reasonably invariably) as possible. It is hoped that more stamps will come to light as more collectors focus on this aspect of their wood type collections. Four lines, top and bottom curved. In use c1937–c1942. The earliest confirmed reference to ACME Wood Type Mfg Co ACME Wood Type Mfg Co occurred in an advertisement in the August 1937 issue in American Printer & Lithographer. The exact date of the founding of the company is, as yet, elusive. 61 Beekman Street, New York City was the address listed in ACME’s 1937 specimen Catalog No 20. A by-line in May 1944 issue of Book Production magazine stated that American Wood Type Mfg Co acquired ACME “several years ago,” making the actual date less than certain, though 1942 a not unreasonable speculation. One line. Dates of use unknown. This manufacturer’s stamp may very likely be connected to Allied Wood Type Mfg Co of New York which was in business at least as early as 1948, as listed in that year’s New York City directory; and at least as late as 1960, as the company was listed in the International Year Book published that year. Allied’s address was listed as 231 Mercer Street, New York City in the company’s 1950 specimen Catalog No 50. No information for Allied has yet been found earlier than 1948 or later than 1960. There is as yet no conclusive evidence to clarify when this stamp configuration was actually used. Further research is needed. AMERICAN || WOOD TYP CO.
Two lines, top line larger size. Dates of use unknown. There were at least three companies that went by some configuration of the name “American Wood Type,” one in the nineteenth century and two in the twentieth century. (It might be noted that all of them used Es to spell the word “Type”). The nineteenth century American Wood Type Co was founded by Charles Henry Tubbs in 1879 in South Windham, Connecticut. The company’s name was changed to Tubbs & Co in 1902, and then to Tubbs Mfg Co in 1905 when Charles Tubbs sold his interests to four employees who moved the company to Luddington, Michigan. Tubbs Mfg Co was in business until 1909 when it was acquired by The Hamilton Mfg Co. The twentieth century, American Wood Type Co, owned and operated by Frank Gerhardt, was located at 302 McDougal Street, Brooklyn from at least as early as 1912. Gerhardt’s American Wood Type Co operated until August 1921 when the name was changed to American Brass & Wood Type. This manifestation of the company operated until at least 1933. There are currently no known specimen catalogs showing this company’s typographic offerings, and no information yet uncovered to indicate when the business stopped production, or what happened to the company’s material and equipment after it went out of business. The next twentieth-century company using the American Wood Type name is generally more well known today. In 1932, Rube Mandel founded American Wood Type Mfg Co in New York City.2 American Wood Type Mfg Co continued to produce wood type until September 2001. The equipment and templates were sold off and changed hands in the early 2000s. A portion of this equipment was purchased in 2010 to start the Virgin Wood Type Company of Rochester, New York. Of the three companies, it is very unlikely to be Rube Mandel’s American Wood Type Mfg Co, as there is some evidence to indicate that company never employed the use of a stamp to mark their type. It may be Frank Gerhardt’s company — that used the name American Wood Type Co 1912–1921 — though some of the type designs the stamp has been found on were more common in the nineteenth century than in the twentieth. The stamp is configured differently from any other stamps used by Tubbs in the nineteenth century, so it is difficult to ascertain conclusively whether it is Tubbs related. Further research is needed. The image of this type block is from the personal collection of David Wolske. One line. In use 1853–1854. Horatio & Jerimiah Bill worked for Edwin Allen in Windham, Connecticut for a time before forming their own company in 1850 based in Lebanon, Connecticut. The company was moved about seven miles north to Willimantic in 1851, to occupy the basement of the American Linen Company. In early 1853, the Bill brothers partnered with a man named Stark to form Bill, Stark & Co. 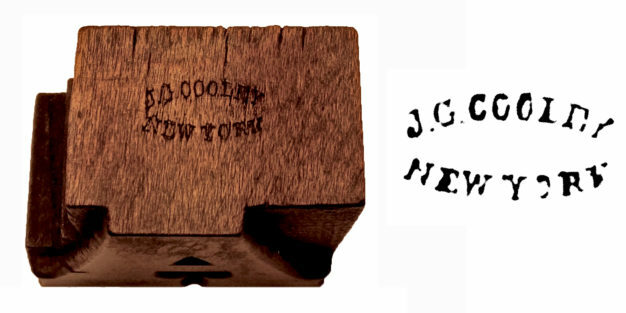 The company was listed as the only firm exhibiting wood type at the Exhibition of the Industry of All Nations held in New York City in 18533 Stark left the company sometime in 1854 at which time the firm was referred to simply as H & J Bill. The business failed later that year and was shuttered by late 1854. The holdings of the company were eventually sold to William H Page in 1856, who moved the equipment to Greenville, Connecticut. Two lines, curved. In use 1859(1863)–1866. In 1852, JG Cooley purchased the wood type concern of Edwin Allen in South Windham, Connecticut. In 1859, Cooley partnered with Robert Lindsay4, changed the name of the company to JG Cooley & Co, and opened offices in the old Tribune Building at 1 Spruce Street, New York City. In 1863, all production was moved from Connecticut to New York, and the operation was expanded to include 3, 5, 7 & 8 Spruce Street. In 1864, Cooley ended his partnership with Lindsay. In 1866, he partnered with Samuel Dauchy and changed the name of the company to Cooley & Dauchy. It seems there was a fire sometime during 1868 that did significant damage to their type production facilities, the extent of the damage or the impact on the firm needs further research. In 1869, William Page purchased the wood type manufacturing portion of the business5. In American Wood Type 1828–1900, Rob Roy Kelly indicated that this stamp was in use 1859–1868. To refine Kelly’s assertion, it should be noted that this particular stamp was first used either in 1859 when the company’s offices in New York City were opened, or in 1863 when all production was moved to the city. It is certain that the stamp was not used after 1866 when the name of the company changed to Cooley & Dauchy. This image was published by Robert P Long in his 1980 Wood Type & Printing Collectibles. Two lines. In use 1917–c1970. The image of this type block is from Philip Moorhouse’s collection at The World of Wood Type. EMPIRE TYPE FOUNDRY || DELEVAN || N.Y.
Three lines, top two curved. In use 1917–c1970. The Empire Type Foundry was a father and son partnership between Wilbur & Claude Persons — based in Delevan, New York, near Buffalo — that began operations August 1893. The company added wood type production at least as early as November 1915, as evidenced by their Catalog No 15. Currently, the last recorded catalog, Catalog No 25, was published in 1952. Empire Type Foundry ended all type production, including wood type manufacturing, in 1970. It is as yet unclear what became of the materials and production equipment. There are two known manufacturer’s stamps used by the company, but it is not yet clear in what time frame either were used. Further research is needed. EMPIRE || W. T. CO.
Two lines, top line curved. In use 1900–1926. Empire Wood Type Company was a New York-based wood type manufacturing company established in 1900 by Edward Capen. The first business address was listed as 79 Centre Street. An advertisement in the American Printer & Lithographer suggested that the company produced both enameled and plain-faced wood type. Sometime in late 1902, the company moved to East 5th Street. This location was destroyed by fire in 1910 and the company was subsequently moved to 31 Ferry Street. There is as yet no known specimen catalog, though advertisements for the company indicated that catalogs were published at least as early as 1903. In January 1926, Capen sold the company to Medard Rotsært, who moved manufacturing to 230 Pearl Street, and by 1932 moved to 322 Pearle Street. Rotsært published a specimen catalog shortly after he purchased the company in 1926. The catalog indicated that the name of the company was to be changed to “The Printer’s Service Shop.” Curiously, the New York City business directories never registered this change and continued to list the company as Empire Wood Type Co until Rotsært’s concern was acquired by Rube Mandel of American Wood Type Mfg Co in 1936. Type held in the collection at the Hamilton Wood Type & Printing Museum, Two Rivers, Wisconsin. Two lines and rule element, top line curved. In use 1885–1889. James Edward Hamilton founded the Hamilton Hollywood Type Co, in Two Rivers, Wisconsin, August 1880. In December of the following year, Hamilton partnered with Max Katz to form Hamilton & Katz in 1881. To date, there has been no example of a Hamilton & Katz stamp found. In November 1885, Katz retired from the company and William Baker purchased his interest. The company was renamed, Hamilton & Baker. It is unclear when the company might have begun marking their type with a stamp after 1885. Before this, the company affixed a paper label to the side of their type blocks. In January 1889, Hamilton bought out Baker’s share and renamed the company The Hamilton Manufacturing Company. Five lines, top and bottom line curved. In use 1889–1891. In January 1889, Hamilton bought out Baker’s share and renamed the company The Hamilton Manufacturing Company. On August 1, 1889, the Chicago Office of The Hamilton Manufacturing Company was opened at 259 Dearborn. In May 1891, the Chicago offices were moved to 327 & 329 Dearborn Street. It is unclear how long the Chicago Office remained open, though it was listed in Hamilton accounting ledgers until at least 1902. On January 4, 1891, the purchase of the Wm H Page Wood Type Co of Norwich, Connecticut was finalized. In October of that year, Hamilton established a New York Office, listed at 16, 18, 20 Chambers Street. Henry L Bullen — later to become advertising manager and librarian of the American Type Founders Company — was hired and placed in charge of Hamilton’s New York Office, handling all orders east of Pittsburgh. The opening of the New York Offices in 1891 precipitated a change to the manufacturer’s stamp used to mark the company’s type. The New York Office remained active until 1893 when stock in the Eastern Branch of The Hamilton Mfg Co was sold to American Type Founders Company. Type from the collection held at SVA Fine Arts Printmaking, NYC. Photo courtesy of HanJu Chou. Two lines. Die-stamped, on shoulder. In use 1891–1906. With the purchase of the Wm H Page Wood Type Co in 1891, Hamilton acquired all equipment and type materials from Connecticut. This included the machines used to produce die-cut type. Hamilton continued to employ this method to manufacture the 17 styles of die-cut type designed by Page and Setchell until around 1906 (and no later than 1909). The example here clearly shows the stamp reversed. It is as yet unclear if this was an anomaly, or if Hamilton consistently stamped their die-cut type in this manner. Two lines. In use 1891–1927. On January 4, 1891, the purchase of the Wm H Page Wood Type Co was finalized. Hamilton would go on to acquire the wood type manufacturing companies of Morgans & Wilcox in December 1897; Heber Wells in August 1899; and Tubbs Mfg Co in June 1909. In 1919, JE Hamilton retired from the company and his son, George S Hamilton became President & Director. In early 1927, the formerly privately owned business became a publicly traded company. A minor name change — dropping the definite article — accompanied this shift. Hamilton Manufacturing Company was listed on the Board of Trade of the City of Chicago. The shift in name was first indicated in the company’s September 1927 brochure Gothics and Wood Border. HAMILTON || TWO || RIVERS, WIS.
Three lines. In use 1927–1950s. The subtle change in name from “The Hamilton Manufacturing Company” to “Hamilton Manufacturing Company” precipitated a change in the configuration of the manufacturer’s stamp in 1927. There are three unique sizes of this stamp that have been recorded. It is as yet unclear if the sizes were used at different times that might be used to determine when the type was manufactured, or if the three sizes were used during the same period and simply applied to different sizes of type. Though there is no definitive date, it seems that the use of a stamp to mark their wood type was curtailed around the time when the Printer’s Composing Room Equipment portion of the business was phased out in the late 1950s. M. & W. MFG CO. || MIDDLETOWN, N.Y.
Two lines and star element, top line curved. In use 1880–1897. In 1876, William Thomas Morgans started a wood type manufacturing company with George Young to found Young & Morgans in Napanoch, New York. In April 1880, the factory was destroyed by a fire. George Young sold his interest in the company to HL Wilcox in July, and by September 1880 the company — now Morgans & Wilcox Mfg Co — was producing type at their newly built factory in Middletown, New York. In April 1882, William Morgans died unexpectedly. His wife Sophia Inderlied Morgans assumed his interest in the company until the wood type manufactory portion of the company was purchased by The Hamilton Mfg Co in December 1897. The equipment manufacturing portion of the company not purchased by Hamilton retained the name Morgans & Wilcox Mfg Co and continued to produce printer’s furniture until early 1950. This is the only manufacturer’s stamp known to have been used to mark wood type produced by Morgans & Wilcox Mfg Co.
Three lines, top line curved. In use 1857–1859 & 1876–1878(?). In September 1856, William H Page purchased all assets of the defunct H & J Bill Co of South Windham, Connecticut, and entered into a partnership with James Bassett to form Page & Bassett. In October 1857, the company moved 15 miles southeast to Greenville, Connecticut (the industrial district just outside of Norwich). It appears that the business address was 4th Street, Greenville, Connecticut. Rob Roy Kelly believed that this stamp was used 1857–1859. While this seems entirely plausible, there is as yet no supporting evidence to verify his assertion. It is unclear if the company name was actually changed during this time. This stamp may also have been used again 1876–1878 (1876 was when Samuel Mowry retired and the company name was changed, and 1878 is when the company was moved inside the Norwich city limits). The second set of dates may explain why this stamp has also been found on some type designs that were not released until the late 1860s and early 1870s. This second set of use dates is purely speculative. It is also important to note that the Norwich Business Directory listed the company name as “Page & Co” between 1864–1868. Though this may have simply been an informal way of referring to the business, there is no other published evidence to indicate an actual name change to this configuration. Currently, it is not entirely clear exactly when this stamp was actually used. Further research is needed to clarify. Two lines. In use 1859–1867. In 1859, Samuel Mowry bought out James Bassett’s shares and the name of the company was changed to William H. Page & Co. The business address was also changed at this time to 5th Street in Greenville, Connecticut. The company’s 1859 Specimens of Wood Type, Borders, Ruler, Etc. stated that their type was stamped with “Wm H Page & Co., Greenville, Ct.” confirming the start date of the use of this stamp. In American Wood Type 1828–1900, Kelly indicated that this stamp was used until 1870, but an examination of the company’s 1867 specimen catalog revealed that their type was stamped with just “Wm H Page & Co.” starting in 1867. There is no indication that Kelly was aware of the existence of the 1867 catalog. One line. In use 1867–1876. The company’s 1867 Specimens of Wood Type, Borders, Ruler, Etc. stated that their type was stamped with “Wm H Page & Co.” confirming the start date of the use of this stamp configuration. The 1872 and 1874 specimen catalogs also indicated the use of this stamp configuration. This stamp was used until the company changed its name in 1876, coinciding with the retirement of Samuel Mowry. This image was published by Rob Roy Kelly in his 1964 American Wood Types Folio. One line, curved. In use 1876–1891. In 1876, Samuel Mowry retired and the company name was changed to William H. Page Wood Type Co. The title page of the company’s 1876 catalog Poster Specimens from the Wm H Page Wood Type Co lists its location as “Greenville Norwich Conn.” While the Norwich Business Directory does not list an address in the 1876 directory, the 1877 directory lists Greenville Road, Greenville, Connecticut as the address. The 1878 catalog Specimens of Wood Type stated that “since our last edition was published, we have moved our establishment from Greenville to Norwich, a distance of only a half mile, though it makes a change of Post Office address.” It is not clear what the company’s address changed to with the move. In 1881, the company moved to 112 Franklin Street in Norwich, Connecticut, and then expanded to 108–116 Franklin Street in 1882. In 1887, the company moved a short distance to 286–296 Franklin Street. In 1889, Samuel Dauchy bought out George Setchell’s shares of the business, Setchell had been the President of the company since 1881. By January 1891, the acquisition of the company by The Hamilton Manufacturing Company of Two Rivers, Wisconsin was finalized and all assets of the company were moved west. Two lines. Die-stamped, on shoulder. In use 1887–1891. When the William H Page Wood Type Company patented improvements to the die-cut production method in the 1880s they integrated the process of marking the type with the process of cutting the type. 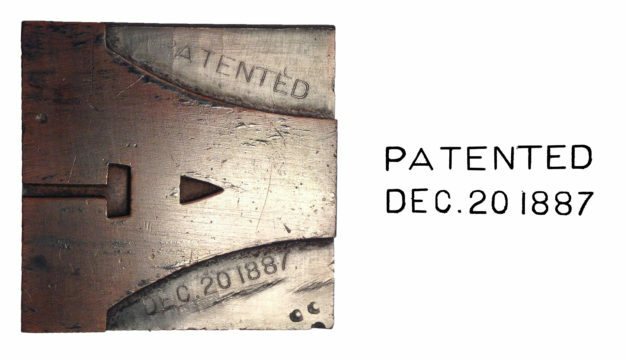 As the face was die-cut, patent date information was pressed into the shoulder. The two-line stamp indicated the patent date — “Dec 20, 1887”. This date was connected to two of the six patents6 awarded to William Page & George Setchell between 1887 and 1889 for perfecting the die-cut process. Page used this marking from 1887, when the patents were granted, until 1891, when the company was acquired by The Hamilton Manufacturing Company. One line. In use 1879–1883. Charles Tubbs, John Martin, and George Kies left the employ of the William H Page Wood Type Co to start the American Wood Type Company in South Windham, Connecticut in 1879. They set the company up in the buildings used forty years earlier by Edwin Allen to manufacture wood type for George Nesbitt. Their first specimen catalog Specimens of Wood Type Manufactured by the American Wood Type Co gives clues that the company used this stamp configuration to mark all of its type. In 1883, Tubbs bought out his partners’ shares to assumed sole ownership of the company. The company’s name remained unchanged. Two lines, top line curved. In use 1883–1902. In May 1883, Charles Tubbs bought out the interests of his two partners and took sole ownership of the company. While the name remained the same, the January 1883 Specimens of Wood Type indicated that the stamp configuration was altered to include “So Windham Ct”. This stamp was used until 1902 when the company changed its name. One line. In use 1902–1904. In 1902, Charles Tubbs changed the name of the business from American Wood Type Co to Tubbs & Co. It is as yet unclear the reason behind the change, but the manufacturer’s stamp used by the company reflects the change in name. In December 1904, four employees bought out the shares controlled by Tubbs and changed the name of the company to Tubbs Mfg Co.
TUBBS MFG. CO. || LUDDINGTON. MICH.
Two lines, top line curved. In use 1905–1909. In December 1904, four employees — Kaufmann (the superintendent), Kurtz (from the case dept), Bashelier (the general manager) and a (as yet unknown) Type Designer — bought out Charles Tubbs’ shares of Tubbs & Co. By early 1905, they had moved the company west to Ludington, Michigan (directly across Lake Michigan from The Hamilton Mfg Co), and renamed the company Tubbs Mfg Co. In October 1908, a long-running court case in which The Hamilton Mfg Co sued The Tubbs Mfg Co for stealing industrial secrets7 was dismissed without a settlement. By June of the following year, Hamilton had bought out Tubbs Mfg Co. The facilities continued to be used by The Hamilton Mfg Co until June 1912, when it was closed and the property sold. This type is held in the permanent collection of The Hamilton Wood Type & Printing Museum. One line. On foot. In use 1828-1835. In the mid-1820s Darius Wells and David Bruce, Jr8 experimented with processes to produce large display type economically. Though this partnership was short-lived, it enabled Wells to invent the lateral router, which made the mass production of wood type practical. Wells started producing wood type commercially with his lateral router sometime in late 1827 or very early 1828. The first specimen catalog of wood type D Wells, letter-cutter was published in March 1828, which listed 161 Broadway as the business address in New York City. 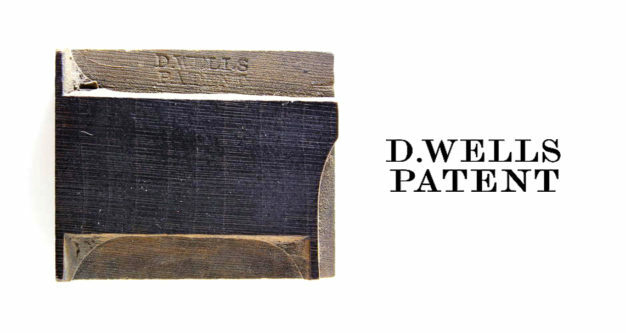 In 1835, Wells took on partners to expand the business to form D Wells & Co.
Two lines. On shoulder. In use 1835–1839. In 1835, Darius Wells took on T Vermilyea and V Riggs as partners to form D Wells & Co. At this time the company was moved to 61 John Street in New York City. In 1839, there was a change in business associates, and ER Webb was brought on as a full partner. Webb had been the manager of William Leavenworth and John DeBow’s wood type business in Allentown, New Jersey. When that firm dissolved, Webb purchased all equipment and materials of the company through the assistance of David Bruce, Jr and added these assets9 to D Wells & Co to form the new partnership, Wells & Webb. Wells & Webb relocated to 28 Ann Street, and in early 1840 also established a manufacturing plant in Paterson, New Jersey. In 1842, the company moved to expanded facilities at 18 Dutch Street in New York City. It can reasonably be assumed that the manufacturer’s stamp used to mark the company’s type was altered to reflect the Wells & Webb name, but as yet no stamp has been discovered. In 1856, Wells sold his shares of the company to Webb but remained manager — until 1859 — of the production facilities located in Paterson. The company’s name was changed, in 1856, to ER Webb & Company. In 1862, Webb bought out the other shareholders including Guy Wells (Darius’s oldest son), William Heavens and William Titterton, and changed the name of the company to, simply, ER Webb. ER Webb passed away in June 1864. It can again reasonably be assumed that the manufacturer’s stamp used to mark the company’s type during the period Webb owned the company was altered to reflect each new name. No stamps, reflecting any of these company names, have as yet been discovered. V. W & Co || 18 || DUTCH St || N. Y. Four lines, top line curved. In use 1864–1867. 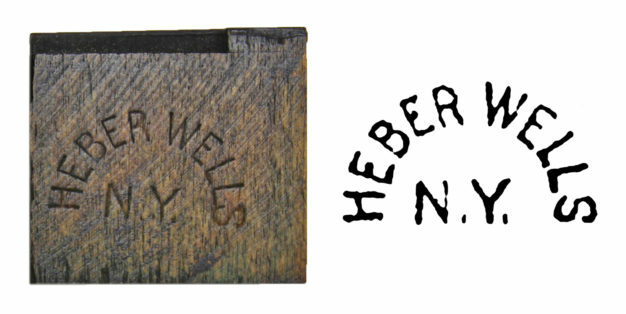 Heber Wells along with two business partners, Alexander Vanderburgh, and Henry Low, purchased the wood type manufacturing concern from ER Webb’s estate after Webb’s death in June 1864. The company operated as Vanderburgh, Wells & Co at 18 Dutch Street, the location of Wells & Webb and its successor ER Webb & Co, since 1842. In January 1865, the company expanded its operations in New York City to include 16 & 18 Dutch Street, as well as just around the corner at 110 Fulton Street. When Henry Low died in 1865, his wife, Mary Beardsley Low stepped into the partnership with Vanderburgh and Wells. In 1867, the manufacturing warehouse located in Paterson burned. 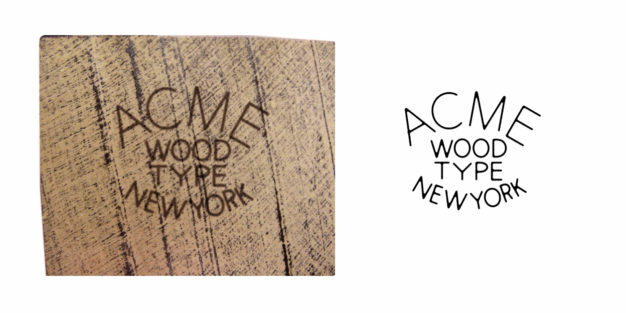 The production of wood type was relocated to the New York City facilities. The company leased warehouse space in Paterson after the fire, but it is as yet unclear how long the company maintained a presence in these facilities. This shift of production to the city offices precipitated the alteration to the manufacturer’s stamp. Two lines, top line curved. In use 1867–1890. In 1867, the manufacturing warehouse located in Paterson burned, and the production of wood type was shifted to the New York City facilities. The alteration to the manufacturer’s stamp reflects this change. Mary Beardsley Low withdrew from the business in 1887 due to failing health. The company continued to operate successfully as Vanderburgh, Wells & Co until 1890 when Heber Wells purchased Alexander Vanderburgh’s interest to take sole ownership. The image of this type block is from Phillip Moorhouse’s collection at The World of Wood Type. HEBER WELLS || N. Y. Two lines, top line curved. In use 1890–1899. In 1890, Heber Wells bought out the shares held by his remaining partner Alexander Vanderburgh and took sole ownership of the company. The new concern was renamed, simply, Heber Wells. Wells consolidated the company’s holdings and moved to 8 Spruce Street in late 1890, and then to 157–159 Williams Street in May 1894. He continued the business under his own name until mid-1899 when he filed for bankruptcy. The firm and all of its holdings were purchased by The Hamilton Manufacturing Co. of Two Rivers, Wisconsin later that year10.